PRODUCT DESCRIPTION: Liquid that uses Federally Exempt actives making it not harmful and safe for use around the home and garden. It works by producing an odor and taste which is disagreeable to a wide variety of home and garden animal and insect pests including but not limited to: aphids, beetles, bats, chipmunks, crayfish, curly tails, deer, ducks, frogs, geese, iguanas, leaf chewers, lizards, marmots, mealy bugs, mice, newts, porcupines, psocids, rats, rabbits, raccoons, rock chucks, scorpions, skunk, spider mites, snails, snakes, squirrels, termites, thrips, toads, voles, white flies, wood chucks and more. You state that Pest Rid spray and granules have a taste and odor that repels lizards (in my case skinks). Is this odor also repellant to humans? I don't want to have to live in a bad odor environment to chase these skinks off. Though you can smell either the granules or spray if you remove the cap and breathe directly from their respective containers, when applied properly this slight odor will be dispersed so much that it won't be detectable by people. The good news is that even these lesser amounts are highly repellent to lizards and skinks so it will still be very active against the target pest. Additionally, inside treatments should be limited with the main focus being paid to the outside of the structure. In fact, the inside should be mostly treated with the Lizard Traps as this is the better approach for inside environments. The traps allow you to catch and remove the targeted pest but if you rely on the repellent alone, there is always the chance that you will chase them to another part of the home which is untreated. So in general, spraying outside around all routes of entry (windows, doorways, etc.) is where Pest Rid should mostly be applied. And for the inside, trapping is the preferred method of control. I live in the panhandle of florida. We live near a farm pond. We have so many green frogs our white siding is a mess. They are most frustrating on the front porch. I cannot sit on the porch because the chairs and cushions are dirty. I do not have any porch lights on and keep blinds pulled where I have them. They love the shutters and gutters and shrubs. What do you recommend for me? If you review our Frog Control article, you'll learn we have several options listed. But based on the description of your problem, I recommend the following three treatments because we've helped many customers with similar situations and we know this process will solve the issue. First, spray the homes siding, turf and shrubs with Cyonara RTS. This will kill the frog food and in the long run, get them to relocate off and away from your home. Treat once a week until the frog population drops significantly and you're mostly content with the few (if any) you're occasionally seeing. This treatment will not affect the frogs in any way but it will get them to move elsewhere. Unfortunately it won't happen overnight and based on what we've seen afield, it will usually take 3-6 weeks for the full effect to kick in. Second, to help get them to move faster, apply the Pest Rid Granules to the ground around the home. Use 2 lbs of granules per 500 sq/ft and apply them once a month. Third, spray any plants, shrubs or flowers where they hang out with Pest Rid Spray. You should also spray the side of the home where they like to hang out like around shutters and gutters, door ways, etc. along with spraying on top of the Pest Rid Granules already applied. The sequence of treatments should be the Cyonara RTS first and then you should let it sit one day. The next day you'll need to apply the Pest Rid Granules and immediately after the granules are out, spray over the top with the Pest Rid Spray. Lastly, retreat with the Cyonara weekly until the frogs are mostly gone and you're satisfied. But plan on applying the Pest Rid once a month – both the spray and granules – to make sure they don't come back. In other words, you won't have to apply the Cyonara forever once the frogs are gone but you should expect to use the Pest Rid spray and granules throughout the warm season of every year as long as there are frogs on your property. Is this safe to use around dogs? Absolutely. If you review its label, you'll see it uses nothing but food extracts for actives. So even if your pet (or any other animal for that matter) was to eat some, it would have no impact on their health. This is why Pest Rid granules and spray are such a good option for use around the home. i live on the ground floor in an apt in SC – i have these green lizards and a black lizard ( which looks like a snake with legs !!! ) that are in my small covered blacony – what is the best and cheapest method of getting rid of them so that i can sit in my balcony? You're looking at it. Get some of the Pest Rid above and simply spray it around the perimeter of your sitting area. Also spray any surfaces you suspect they like to rest on or hide in. You'll see instant results and treatments will last up to 30 days so renew them monthly to keep them away for good. Haven't had the toads chirping since applying. Frogs! Squirrels! Our neighbor has a abandoned pool which has led to heavy frog activity. This year they started to take over our yard too! Hundreds of them big and small. Bought both the dry pellets and spray and treated the mulch surrounding our back yard. That night the frogs are gone! It's been two weeks so far still no frogs. We also have squirrels or a really big frog digging up our mulch, with this product they have seemed to stop also. Now the mulch in the front is being dug up, gotta order more! Very pleased with product and results! This stuff worked great the first day. Chased 3 frogs away. Still working after 2-3 weeks. The frogs were making a mess in two corners of my outdoor cabana every night. Since spraying there is no mess anywhere. Only issue is the nozzle provided with the quart size. The "stream" and "spray" openings both worked about the same as a spray. Will this spray product stop mice and other rodents from chewing electrical wiring in my cars, trucks, and farm equipment? Yes. And it can be safely used on these components too. Now how long will it last? That's tough to say. We've seen where one treatment will cause the animals to leave and not come back for months. In other cases we see equipment exposed to extreme weather loose the residual faster than normal so the treatment only lasts 2-3 weeks and requires more frequent applications. On average, treating once a month should keep them away. But if you want to wait a bit longer to "test" how long you can go that's up to you. Also, if you keep the treatments fresh, rodents will typically quit coming around once they learn the material isn't going away. Essentially you can change their foraging patterns if you stay the course and keep using it. CAN I USE THIS PRODUCT TO CONTROL THRIPS IN PEPPER PLANTS? Pest Rid won't "control" an active infestation. But it can be used safely on said plants to repel insects so an infestation doesn't start. Basically if you have had pest activity in the past (like thrips) and want to make sure they don't come around this year, Pest Rid used now will help. Use it at least twice a month throughout the growing period to insure it does the job. Once a month usually is enough but I say twice a month just to be sure – especially in gardens with a history of problems. But if you have thrips now, get some Insect Soap or better yet, the Multipurpose Insect Killer listed in our Thrip article. Both are organic so they too can be used safely on your plants. But they will kill off all active insects and in turn, get the garden clean so the Pest Rid can best do its job. Lastly, install some Thrip Traps too. Really works! It's been two weeks and I only seen one toad after a heavy night of rain and it did not stay. I have almost 3 acres and used it around my home and walk way. Before using pest rid I had many holes and in my fenced area and toad around my home and walk way. I was worried about my dog getting a hold of one. I was doing salt, coffee grounds, rocks in holes and would of done a toad dance if I thought it would get rid of them. I am so amazed how fast and long Pest Rid has worked. I will be using it again in another week and if it keeps the toads away again and for a longer time, I will order more. Right now this is the only product that has worked. Fantastic! I have had a frog problem next to my pond for years. They would make so much noise, many of my neighbors couldn't sleep. I had to wear earplugs every night. Just after one use, the frogs were gone. I had at least a dozen frogs. They loved my pond to lay their eggs – thousands of them. Please advertise this product more! There are many people begging for this product. I was one of them. My recommendation; Buy it, you will not be sorry. I can't give this product any higher praise! We also scoured the internet looking for solutions. We found a lot of suggestions, many unusable and none effective for us. Then we discovered Pest Rid Exempt. One spray, half the bottle, and they were gone the next night and haven't returned. The treatment was quick and easy, taking less than a half hour to mix and spray. What a relief! Will this stain my siding? This product is designed to be used on all types of siding including painted surfaces, bare wood like cedar, vinyl, aluminum and more and thus far we have not had one report of staining, discoloration, etc. That being said, if you are using some kind of unique siding on your home and are concerned, simply apply some to a small area to confirm nothing will happen. Just a little dab the size of a quarter should be plenty to see. And if you are unhappy about the result of this test, you may return any unused amount and we'll promptly refund you accordingly but in all the years of us selling it around the country, its not caused any kind of problem when used in this fashion. What effect does rain have on your product? Should I re-apply after it rains, or will it still be active? The impact of rain has been factored into its normal residual. This means the window of protection, around 30 days, is an average of what one would expect. So during dry, stable times, treatments will last 5-6 weeks. During unusually "wet" periods, you many only get 3 weeks. Also realize that if you're treating the ground, using the granules will help prolong residual even in heavy rain. And when spraying the side of the home, especially in protected areas like under a porch or other overhang, liquid treatments will last 5-6 weeks for sure. But out in the open, flat areas taking direct rain will be impacted the most and though 1-2 rains a week won't have much of an impact, rain falling 4-5 days a week will take a toll on the overall performance. Also remember target pests will have already been rerouted away from the treated area when you first treat so even as the material breaks down, they aren't smart enough to know they can come back so there is a time period of when you won't have any chemical in place and pests won't come back. In the big picture, this means if you stay the course and try to treat once a month, you should be able to obtain the desired results because this material will work immediately by clearing the treated area and it will take awhile for the target animals to repopulate this area even as the treatments wears down. Squirrel climbs screen door to then jump onto bird feeder. Can birds smell this? I like the birds! Birds do not smell or taste like other animals such as squirrels or people. For this reason they would not care if you sprayed some Pest Rid on the screening if that's what you're thinking about doing. That being said, I don't think the Pest Rid would be your best option. First, it will wear down and constantly need to be reapplied. Second, I don't think you can get enough of the active to adhere to screening to have an impact on foraging squirrels. So what will work? No doubt our SOUND REPELLER is a good option. It works on squirrels for sure and if you placed it along the side of the home pointed at the door, probably at ground level (assuming the squirrel is approaching on the ground or deck), you can configure it to use the motion detector to set it off. The unit comes with a remote control key so you can turn it off and on as needed in case you want to go out using the door. Also, you can set it to work during the day only since squirrels tend to be active during the day only. This way it would not go off at night. ]Lastly, it runs on batteries and has an optional audible sound you should use. Once a squirrel sets it off, the unit will frighten the squirrel by using both Ultra Sound and Audible Sound. In most cases, it just takes one encounter to scare the squirrel away. And it will usually keep the animal away for good. Since the unit would be on the ground, the bird feeder activity would not affect or make it go off. This way the birds should not care about it being there or even set it off. Plus, it has a motion detector sensitivity setting. This means you can turn it down enough to where it will only go off if something walks right in front of it. I’m trying to get rid of skinks and lizards gallor! But I have a bunny family that lives out back, will this harm them?? Our Pest Rid product will not harm any person, animal or insect. It's only mode of action is to "repel" unwanted wildlife. Rabbits won't acknowledge it so they'll stay. But lizards and snakes don't like it and stay off treated areas. Love that I was able to get this spray! I have been looking for something organic and this seems to do the job. This is our second time buying this in the last couple of months. We got this for the little green tree frogs that cover the outside of our house at night. We wasn't sure this was going to work when we placed the first order but it really worked!! It keeps the frogs away. I'm sure we'll be placing another order. Not sure what is eating my plants, but the liquid spray seems to be working and this despite non-stop rain we're having. New growth is just starting so I'm anxious to see if initial success holds up. If so, I would consider adding the granular Pest Rid to the spray to extend the effectiveness from 1 month to 3 between applications. Great to hear about the positive results thus far! No doubt the rain is no help and moving forward, here are some suggestions to help stop the problem. First, knowing the "culprit" is big. There are many more "options" which hinge on what might be doing the damage and matching the best option to the problem is always the best approach. 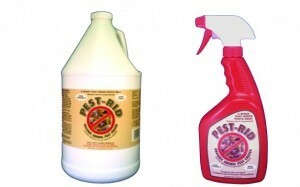 Pest Rid can cover most any aggressive animal or insect but there could be a "better" fit. So if possible, try to learn what is eating the targeted plant (deer, rabbit, turtle, rat, lizard, caterpillar, slugs, snails, etc.). Second, using granules might help but if its something "flying" to the plant, they will serve no purpose which leads us back to knowing the culprit. In general, we have found spraying targeted plants seems to be best when plants are targeted but if its a crawling pest coming to visit, the granules can help too by making the trail to the food uncomfortable for them. I have a York AC unit and had to repair the unit 4 times last summer because frogs kept getting into the circuit board and shorting it out. Haven't had a call for repairs at all this summer since I have been spraying the repellent. I spray about every two-three weeks. Seems to have solved my problem with frogs that were attracted to the unit.